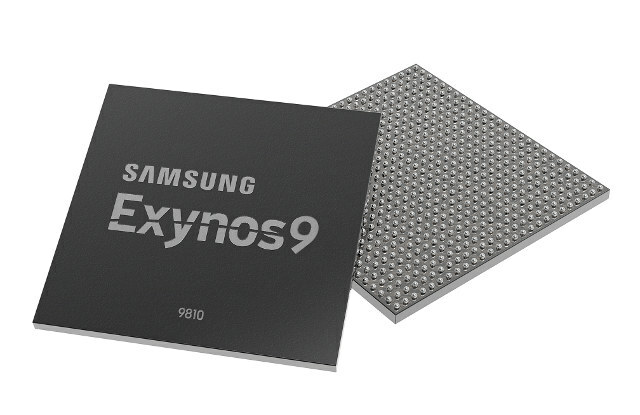 Samsung Electronics has just announced the launch of Exynos 9 Series 9810 (Exynos 9810) manufactured with Samsung’s 10-nm FinFET process, featuring an eight core processor clocked up to 2.9 GHz, a gigabit (1.2 Gbps) LTE modem and deep learning-enhanced image processing. Single core performance is aud to be improved by two-fold, while multi-core performance gets a 40% improvement compared to the previous generation chip, which should be Exynos 8895. ARM Mali-G72 GPU is said to bring more realistic graphics along with 20% more performance. Exynos 9810 introduces sophisticated features to enhance user experiences with neural network-based deep learning and stronger security on the most advanced mobile devices. This cutting-edge technology allows the processor to accurately recognize people or items in photos for fast image searching or categorization, or through depth sensing, scan a user’s face in 3D for hybrid face detection. By utilizing both hardware and software, hybrid face detection enables realistic face-tracking filters as well as stronger security when unlocking a device with one’s face. For added security, the processor has a separate security processing unit to safeguard vital personal data such as facial, iris and fingerprint information. The Exynos 9 Series 9810 is currently in mass production, and should be found in smartphones, personal computing devices, and automotive products later this year. More details can be found on the product page. Also last year’s flagship Exynos – the 8895 (the one in the S8) had the theoretical ability to record [email protected] But the S8 can only record [email protected] So what’s the explanation for this?! Is it possible to enable the S8 to record [email protected]? Maybe using a different ROM? So what’s the point of making a SoC which is capable of [email protected], if all the devices that use it can’t utilize its full potential?! Why not enable the exynos version to use its full potential, no matter that the minority of the model’s users (the ones with Snapdragon) would have inferior capabilities?! And yes – I know that apple is doing a similar thing with its modem – limiting the Qualcomm one, just because other varieties have an inferior Intel modem. But theoretical modem capabilities (which are also limited by the networks capabilities) are much less important than video recording capabilities! I hope Odroid will produce an SBC with this chip on it! Hardkernel will likely not be able to get that processor, but I’m hoping they may get one of the previous generation that would still be an upgrade to Exynos 5422.